Here are some snazzy birthday facts about 19th of February 1958 that no one tells you about. Don’t wait a minute longer and jump in using the content links below. Average read time of 10 minutes. Enjoy! What day was my birthday Feb 19, 1958? February 19, 1958 was a Wednesday and it was the 50th day of the year 1958. It was the 8th Wednesday of that year. The next time you can reuse your old 1958 calendar will be in 2025. Both calendars will be exactly the same! This is assuming you are not interested in the dates for Easter and other irregular holidays that are based on a lunisolar calendar. There are 304 days left before your next birthday. You will be 62 years old when that day comes. There have been 22,341 days from the day you were born up to today. If you’ve been sleeping 8 hours daily since birth, then you have slept a total of 7,447 days or 20.39 years. You spent 33% of your life sleeping. Since night and day always follow each other, there were precisely 757 full moons after you were born up to this day. How many of them did you see? The next full moon that you can see will be on May 18 at 21:13:00 GMT – Saturday. Fun stat: Your first one billion seconds (1,000,000,000) happened sometime on October 28, 1989. If a dog named Maximillion - a Icelandic Sheepdog breed, was born on the same date as you then it will be 294 dog years old today. A dog’s first human year is equal to 15 dog years. Dogs age differently depending on breed and size. When you reach the age of 6 Maximillion will be 42 dog years old. From that point forward a medium-sized dog like Maximillion will age 4.5 dog years for every human year. Having already inherited the throne of the Polish–Lithuanian Commonwealth through his mother Catherine Jagiellon of Poland in 1587, Sigismund III of the House of Vasa is crowned King of Sweden, having succeeded his father John III of Sweden in 1592. In Austin, Texas the newly formed Texas state government is officially installed. The Republic of Texas government officially transfers power to the State of Texas government following the annexation of Texas by the United States. The publication of Betty Friedan’s The Feminine Mystique reawakens the feminist movement in the United States as women’s organizations and consciousness raising groups spread. Forty-four people are killed in a prison brawl in Apodaca, Nuevo León. What does my birthday February 19, 1958 mean? 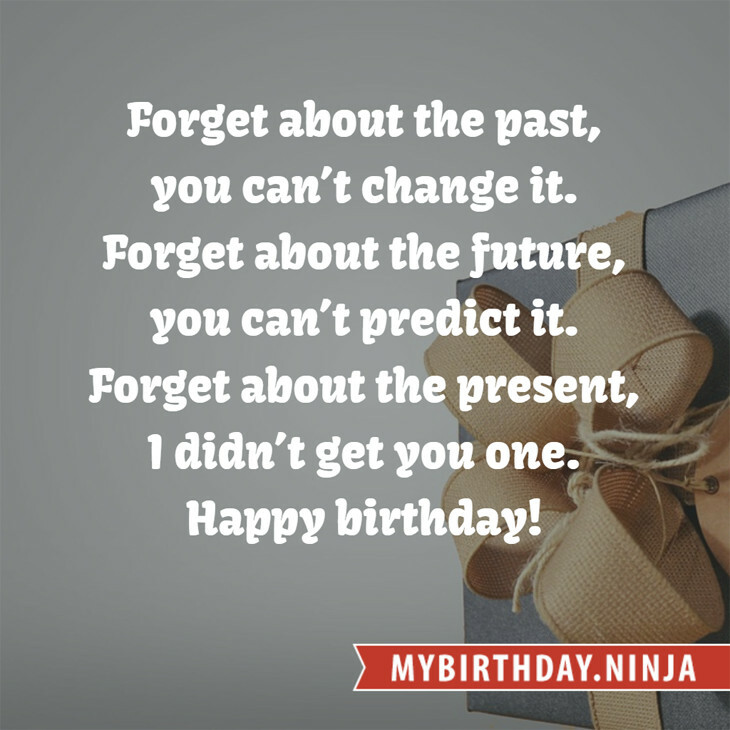 Your birthday numbers 2, 19, and 1958 reveal that your Life Path number is 8. It represents experience, authority and endeavour. You are gifted with natural leadership and the capacity to accumulate great wealth. The following celebrities also have the same life path number: Emily Deschanel, Tony Lovato, Laima Vaikule, Kevin Hearn, Julian Cheung, John Madden, Ted Geoghegan, Martin Balsam, Crispin Glover, Krishnam Raju. 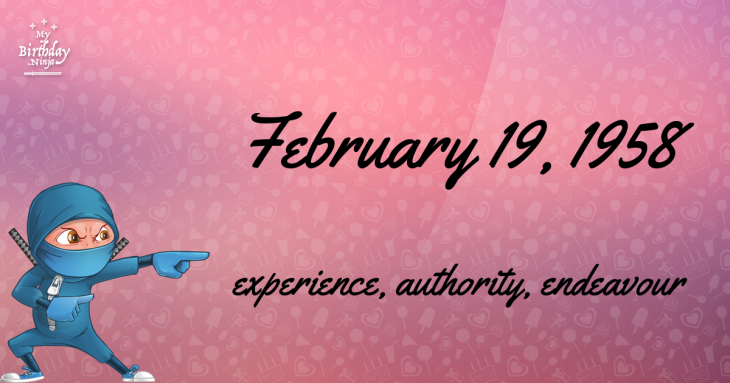 What is the birthday horoscope for Feb 19, 1958? The Western zodiac or sun sign of a person born on February 19 is Aquarius ♒ (The Water-bearer) – a fixed sign with Air as Western element. The ruling planet is Uranus – the planet of originality. According to the ancient art of Chinese astrology (or Eastern zodiac), Dog is the mythical animal and Earth is the Eastern element of a person born on February 19, 1958. Fun fact: The birth flower for 19th February 1958 is Violet for modesty. What is the Love Match for Feb 19, 1958? When it comes to love and relationship, you are most compatible with a person born on June 22, 1984. You have a Love Match compatibility score of +168. Imagine being in love with your soul mate. On the negative side, you are most incompatible with a person born on January 26, 1947. Your incompatibility score is -136. You’ll be like a cat and a dog on a love-hate relationship. Arf-arf, I want to bite you. Meow-meow, stay away from me! How many babies were born on February 19, 1958? Base on the data published by the United Nations Population Division, an estimated 103,731,629 babies were born throughout the world in the year 1958. The estimated number of babies born on 19th February 1958 is 284,196. That’s equivalent to 197 babies every minute. Try to imagine if all of them are crying at the same time. What is the popular baby name on 19 Feb 1958? Here’s a quick list of all the fun birthday facts about February 19, 1958. Celebrities, famous birthdays, historical events, and past life were excluded. Try another birth date of someone you know or try the birthday of these celebrities: January 19, 1972 – Angham, Egyptian singer-songwriter, producer, and actress; September 2, 1923 – Ramón Valdés, Mexican actor (d. 1988); January 17, 1984 – Kelvin Fletcher, English actor and model.